(CN) – U.S. Interior Secretary Ryan Zinke on Thursday removed two national monuments from his review of 27 that President Donald Trump has sought to either make smaller or remove protections from entirely, saying they will no longer be considered for changes. Craters of the Moon National Monument in Idaho and Hanford Reach National Monument in Washington state will not be modified and are exempted from the review, Zinke said. Environmental organizations hailed the announcement, but said the Trump administration’s continued review of the 25 remaining monuments is ill-advised and needs to stop. President Bill Clinton designated Craters of the Moon in 2000, shortly before leaving office. The park consists of approximately 1,100 square miles of sagebrush-dominant grasslands and lava fields. The three lava fields comprise the Great Rift of Idaho and feature unique geology including lava tubes, tree molds – trees incinerated by molten lava – and nearly every variety of basaltic lava. 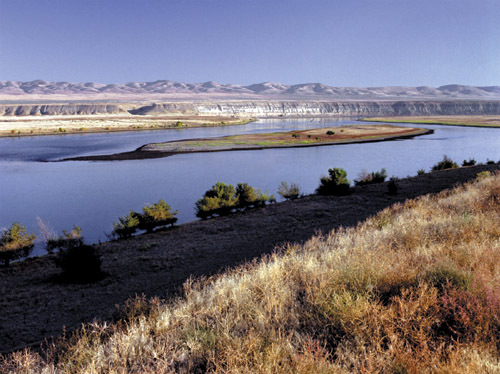 The Hanford Reach National Monument encompasses a free-flowing stretch of the Columbia River that makes up the border between Oregon and Washington state. The monument consists of vast, grassy plains of southeastern Washington state that hold some of the most biodiverse shrub-steppe habitat west of the Rocky Mountains. What makes the monument especially unique is its center, which contains the radioactive legacy of the nuclear arms race. Due to the secrecy surrounding the development of plutonium during the World War II era, the government established a large 900 square-mile buffer around Hanford Engineer Works. Clinton used the buffer to create the border of the monument, also in 2000. Zinke has already recommended Bears Ears National Monument, a 1.9 million-acre national monument designated under the Antiquities Act by President Barack Obama in the waning days of his administration, be shrunk significantly, although not rescinded as many feared. The League of Conservation Voters released a statement earlier in the week saying that an overwhelming majority of the public support keeping the national monuments intact, with 2.7 million people submitting comments against reducing or eliminating the public land.